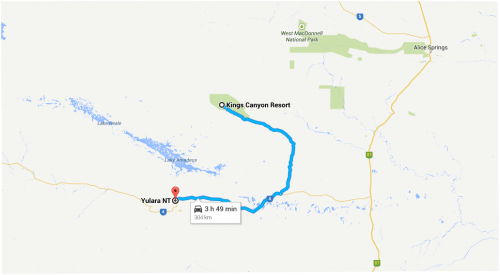 Dogs – Can dogs be taken to Central Australia? How Big is Ayers Rock / Uluru? 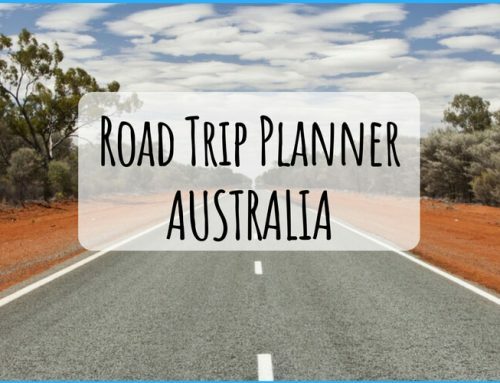 Driving from Melbourne to Uluru was one of the best Australian road trips we have done, the East Coast is great to drive, but the outback is even better! The huge distances between places can sometimes deter people from driving, especially with kids, but it is an awesome experience and highly recommended. Flying from Melbourne to Yulara (Uluru) takes about 3 hours… quick, but lacking in scenery! Nothing quite prepares a person for the sight of Uluru, but there is so much more to discover along the way. Two weeks to do the trip was ok, though another week would have been even better. It’s a long drive, though nothing compared to a full lap of Oz. 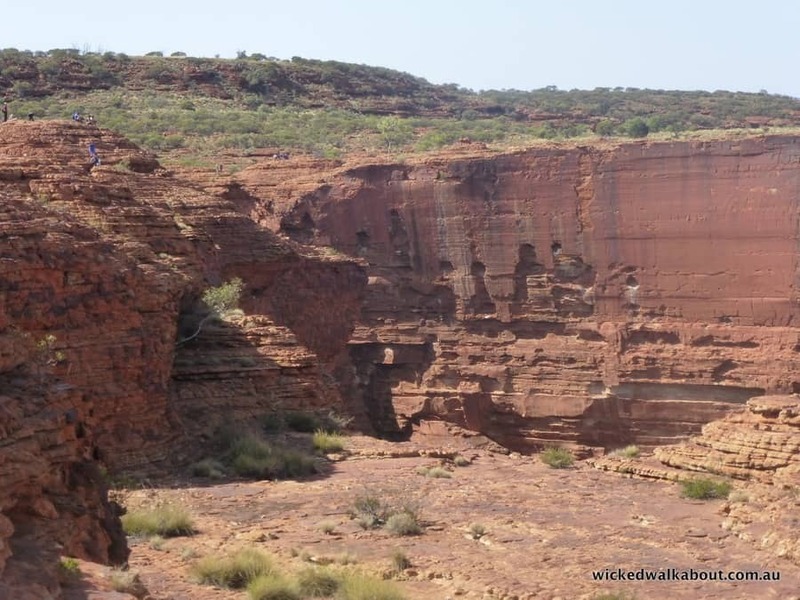 We drove from Melbourne to Uluru & Kings Canyon then on to Alice Springs and return in 14 days with no problem and saw some incredible countryside. 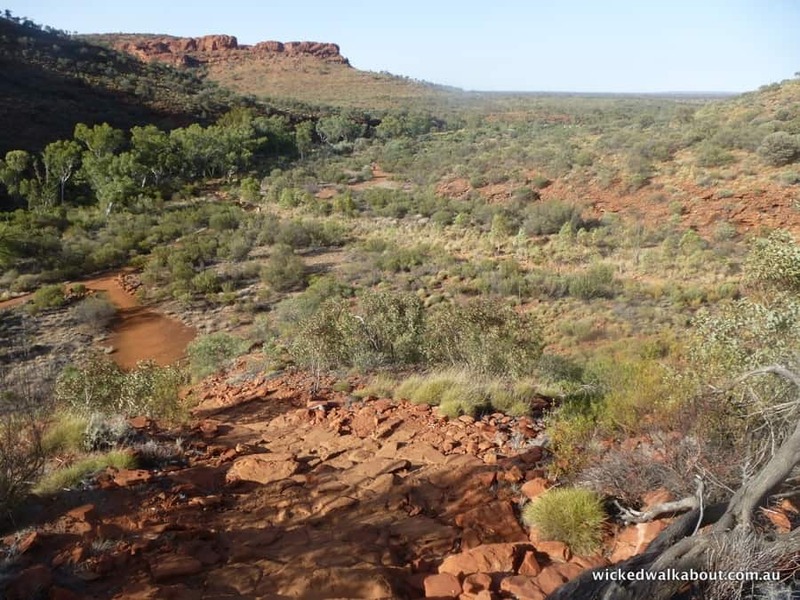 The Melbourne to Uluru drive is an excellent introduction to the Outback of Australia. All the roads we used were sealed and perfect for 2 wheel drive cars. 4 Wheel Drive only roads are plentiful for the more adventurous. Yes. But they cannot go into National Parks, this applies to all of Australia. We have added some pet-friendly accommodation options in the itinerary below. Please always book in advance and make sure it is still ok to bring your dog to any of the places listed. Join this Facebook group for advice on travelling with your dogs and to find people who may be in the same location and looking to share dog-sitting times. 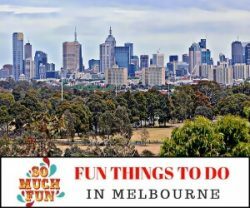 The first day we left Melbourne and travelled via Ballarat, Nhill …. 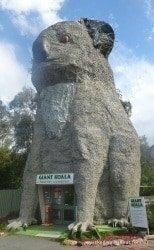 past the Giant Koala at Dadswell Bridge and finished the day in Murray Bridge at a clean and comfy motel. There is plenty to see and do along this stretch of the trip if you have time and are not in a hurry to get to ‘The Rock’. A super motel with a spacious family room, heated swimming pool for the kids and a BBQ area for the evening meal. It was an ideal stopover for the kids to relax and then make an early start the next morning. The Murray Bridge Tourist Park is pet-friendly at their discretion. Phone in advance to check. Melbourne to Murray Bridge in South Australia. As we were wanting to do the drive to Uluru without spending too much time along the way, we made a quick stop in the German settlement of Hahndorf. It’s such a sweet little village that it seemed a shame to not stop in there. Heading straight for Central Australia, we by-passed Adelaide and reached Port Augusta for the evening. Pulling into the pre-booked motel with a swimming pool, the Acacia Ridge, it was a welcome stop at the end of the day. The Standpipe Golf Motor Inn offers some dog-friendly rooms, book ahead though to be sure or phone them on (08) 8642 4033 . Up and on the road, heading north and finally getting into the Outback of Australia! It took us about 9 hours as we stopped along the way and dawdled a bit. Lake Hart Salt Lake was a great lunch spot along the way. About 2 hours north of Port Augusta, the salt lake is a fun spot to play and stay a while. 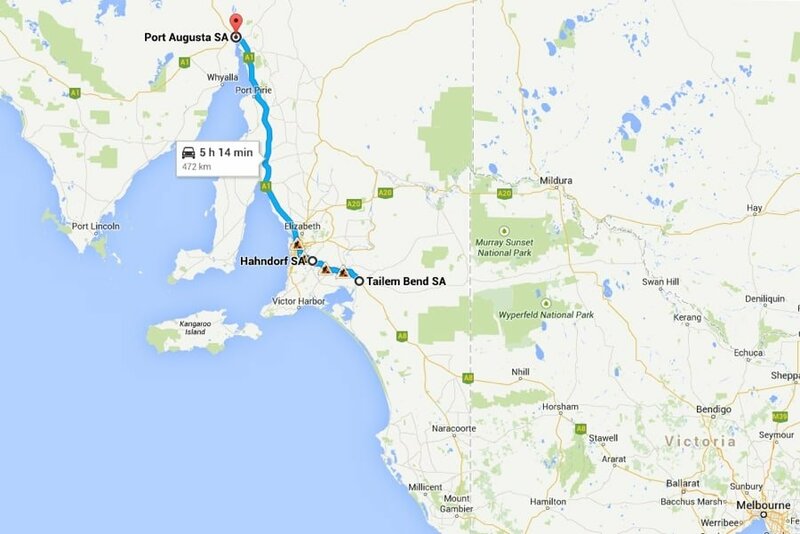 Port Augusta to Coober Pedy – a long drive, but interesting and with a few roadhouses and fuel stops along the way. Motels: Coober Pedy has some unusual accommodation. The Underground Motel is one of the most popular motels and the Zen Underground B&B is fabulous too. The Lookout Cave Motel is a pet-friendly underground motel option that has come recommended – book in advance and make sure you can stay with your dog. 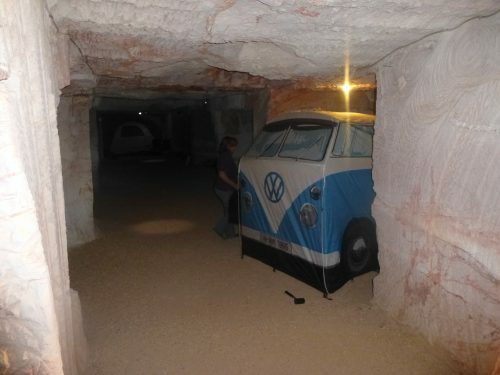 Camping: We camped underground at Riba’s, just outside of Coober Pedy. 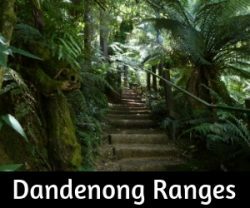 The world’s only underground camping ground! It is fine to lay a ground sheet and simply sleep in the underground area, but we wanted to put the Kombi campervan tent up, just for the amusement value. Riba’s run their own underground opal mining tour and offer the first-night camping free with a mine tour booking. It is definitely worth joining a mine tour when in Coober Pedy and there is a choice of a few. Most people live underground to avoid the heat and a tour of an underground house is available too. The Dingo Fence & Breakways are worth adding to the list of ‘to do’s’. After a good look around Coober Pedy, we headed north again. Along the way are roadside stops for petrol and food etc., plus accommodation options. No need to worry about everything being too remote, no need to carry spare fuel unless heading off-road BUT do carry water and a spare tyre! Yeah, finally arrived at Yulara Resort to camp and go see Uluru! The only camping option at Yulara, but it has access to everything and an easy stroll to the supermarket etc. The Ayers Rock Resort Campground allows dogs Please phone before arrival and check that they have space available. The managers of the resort are friendly and love seeing people travelling with their dogs. You cannot take a dog or any pet into the National Park, there is no pet-sitting service at the campground and dogs should not be left unattended. If staying with your dog, try to find another camper who can pet-sit while you visit the Rock. Nothing can quite prepare you for the first sighting of Australia’s monolith – Uluru, formerly known as Ayers Rock. It is stunning and one of the truly iconic images of this country. extends approximately several km’s into the ground. To say this entire area is awesome seems an understatement. It is such an inspiring, stunning place to visit and should be on everyone’s list of ‘must do’s in a lifetime’. 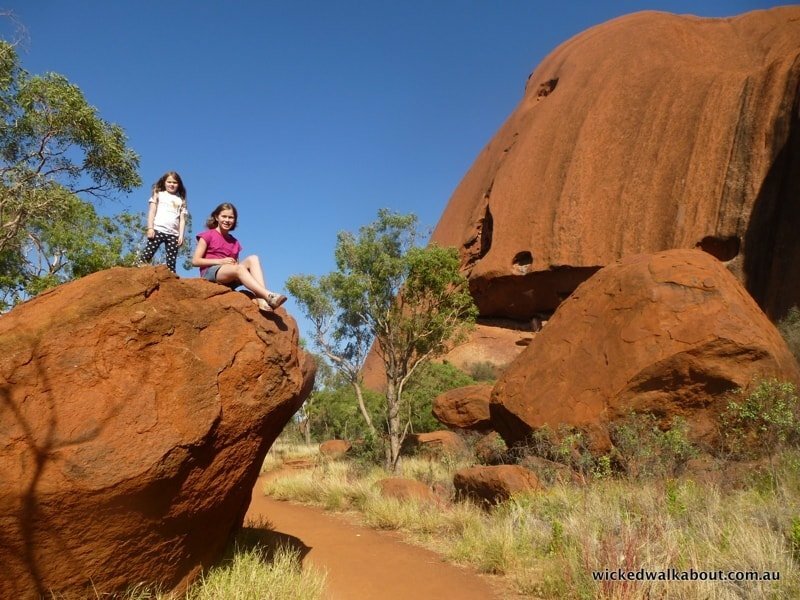 We loved it all and are so glad to have made the trip by car, as it was an incredible experience for the girls to get an idea of the distances in Australia – there is always something well worth seeing every km of the way. Definitely the highlight of the trip for the girls – they were desperate to go see the rock. 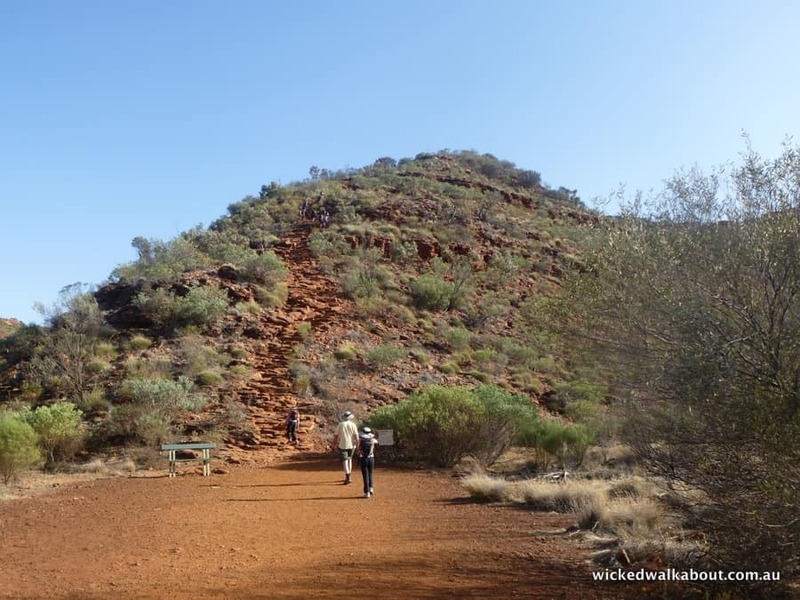 Visitors are discouraged from climbing Ayers Rock / Uluru. 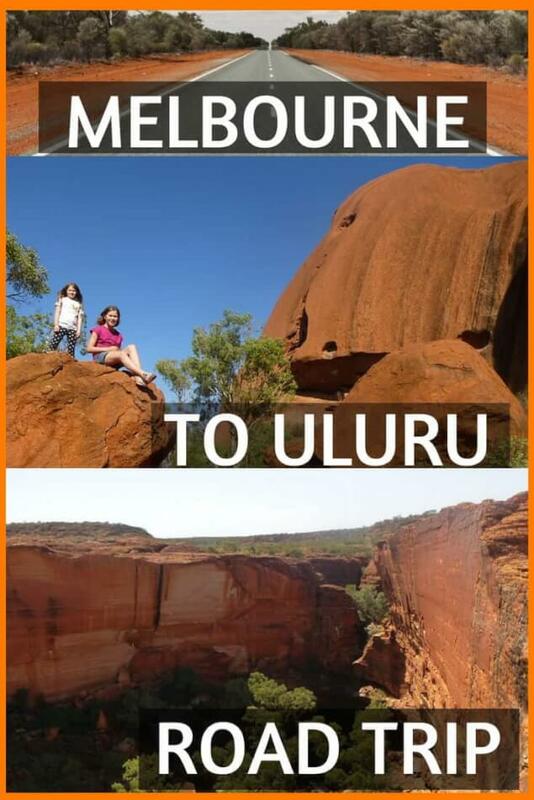 There is only a half hour time difference between Melbourne to Uluru, considering the distance between the two places, it is surprising. 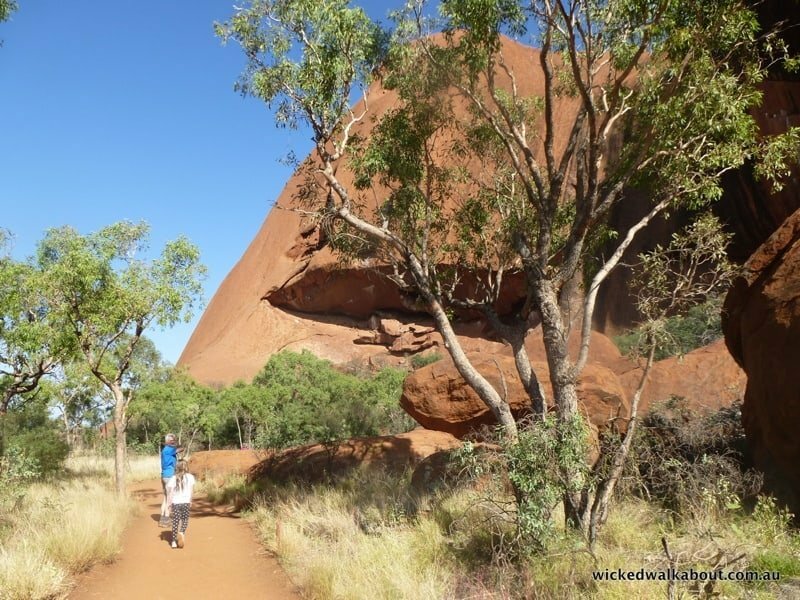 Plenty of tour options around Ayers Rock/Uluru from half-day trips to multi-day tours are available if preferred or visitors can easily self-drive. 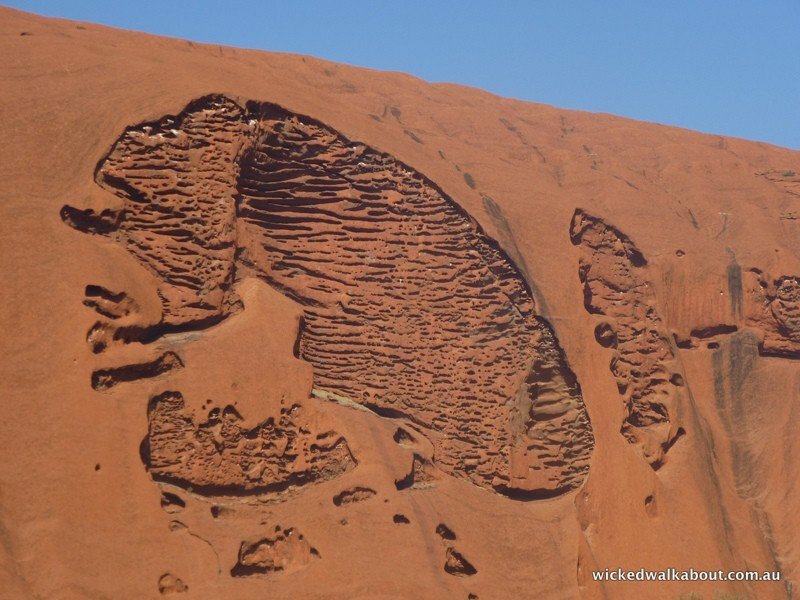 Join a traditional owner of Uluru, a member of the Uluru family, on his traditional homelands and spend time learning about the oldest living culture in the world. Explore this extraordinary environment by 4WD with your Aboriginal guide, stopping along the journey to hear stories such as how Paddy Uluru fought for Aboriginal land rights to where Uluru is today. 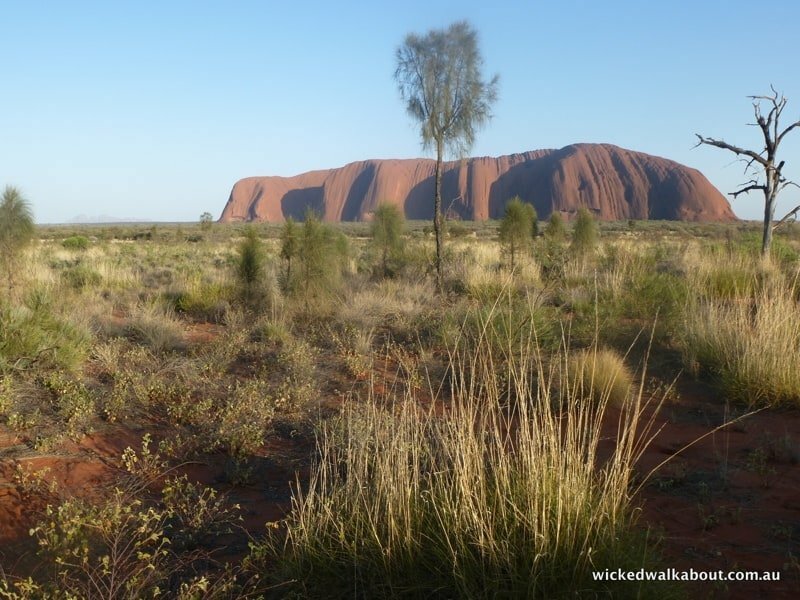 The traditional owners of Uluru want to share their personal story with you on their land. 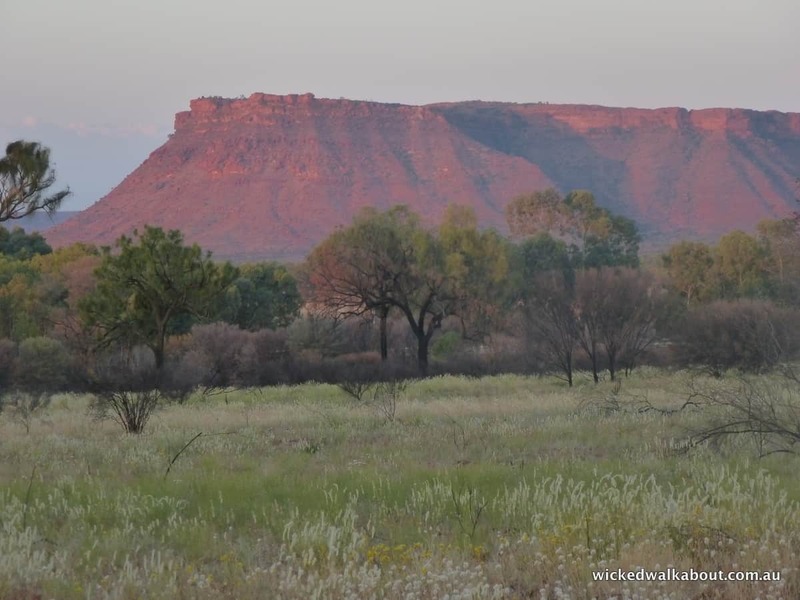 Join them for a yarn and afternoon tea at a remote shelter and hear how they survived in this environment before tourism started in the region. 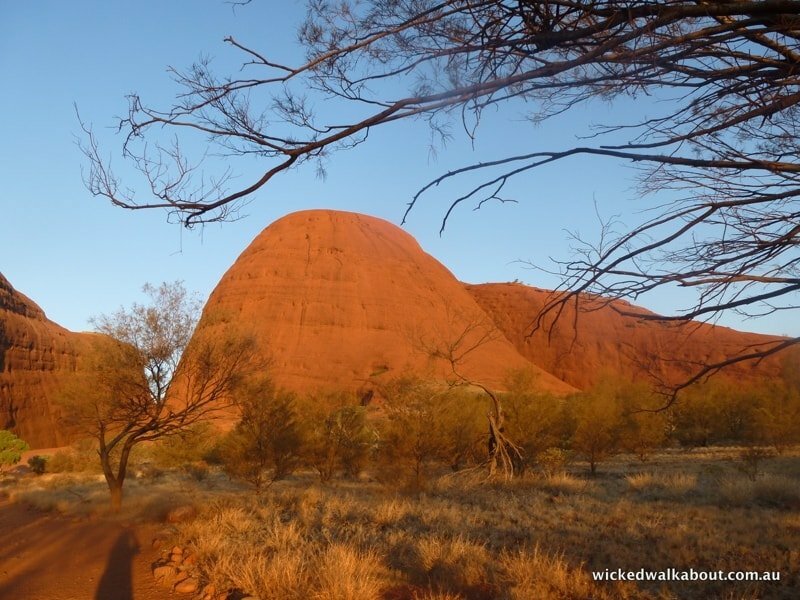 End the day at a private sand dune overlooking Uluru and Kata Tjuta while enjoying drinks and light snacks at sunset. We did various walks at the base of Uluru (it takes about 3.5 hours to walk all the way around the 10km circuit) and spent time at the Cultural Centre. Later in the day, we drove out to the Kata Tjuta/Olgas for the sunset view and some more awesome walking. The base walk around Uluru is about 10kms, it takes around 3.5 hours. This spot is affectionately referred to as ‘the brain’! …. continuing the base walk around Uluru. Kata Tjuta Reasonably high temperatures and winds meant the ‘Valley of the Winds’ trail was closed the day we were there, but we made the most of other walking tracks and watched the glorious sunset. Dogs are allowed in the Kings Canyon Resort Campground. On leash at all times, They cannot go on the Rim Walk or anywhere within the National Park. Today we walked the trail up and around the canyon. To say it is awesome, would be an understatement really. 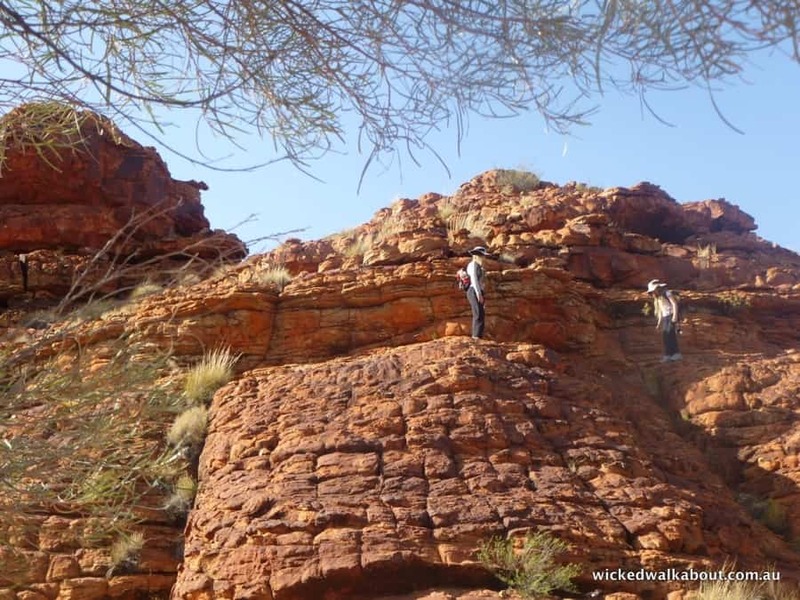 This is something not to be missed in an outback adventure. Not too strenuous, but not a walk that should be done during the heat in the middle of the day though. Take Water. Take snacks. Take a hat and take sunscreen…and a camera of course! Read the Parks PDF for walk details. Looking out from part way up the steps. With all their climbing and exploring, the girls must have covered double the distance of the entire walk overall! Look closely for the people sitting at the lookout area… shows the scale of the area well! Heading down the steps towards the Valley of Eden, a glorious little water hole and sanctuary from the heat. 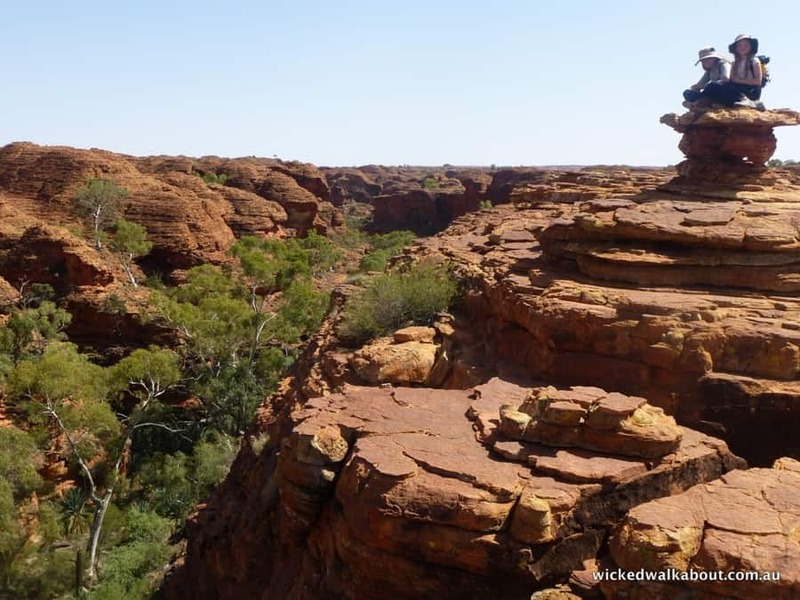 The best time to visit Kings Canyon / Watarrka is during the cooler winter months from May-September. It is possible at any time of the year, of course. Be prepared for much higher temperatures during summer. 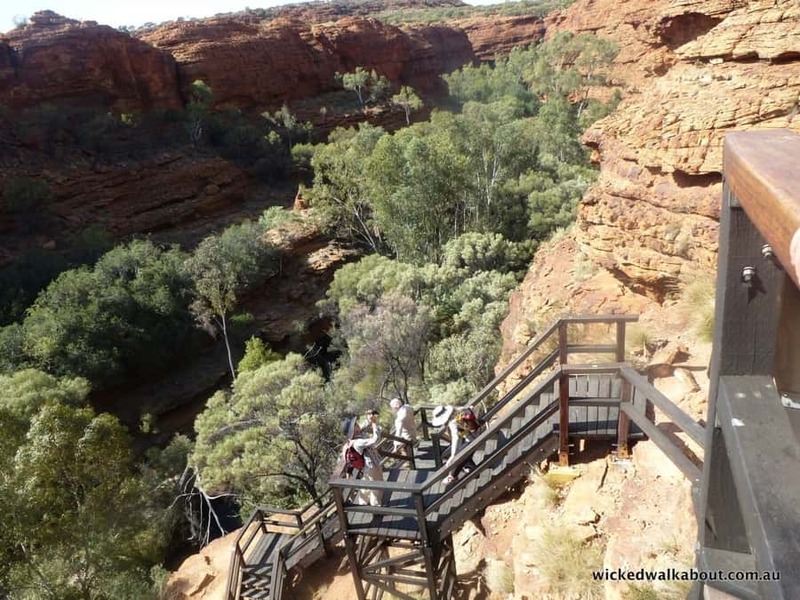 We headed to Alice Springs after doing the Kings Canyon Rim Walk, about a 5-hour drive. As we had a trailer on down the sealed road to the Lasseter Highway and up to Alice that way. 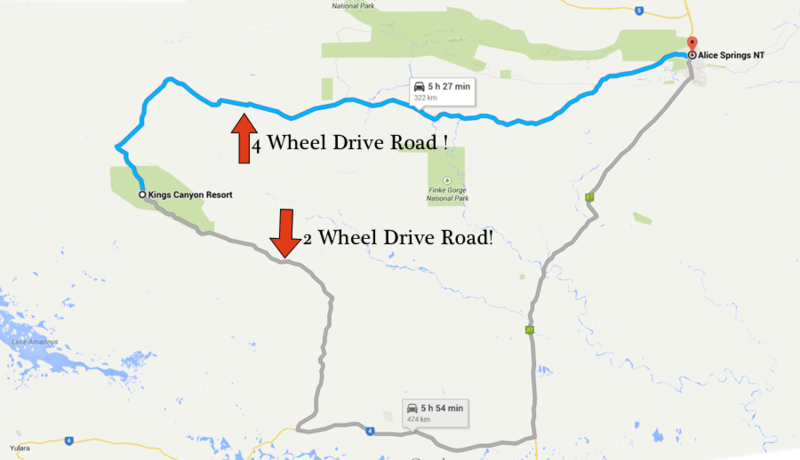 There is another option, of heading to Alice on the dirt road, but it’s quite corrugated and we chose not to risk breaking an axle on the trailer (I’d have loved to go on the back road though… next time, perhaps). Alice offers loads of accommodation options. We recommend the Chifley Alice Springs Resort. Not overpriced and family friendly with a fabulous swimming pool for the kids. The Squeaky Windmill is somewhere a little bit different, not too far from Alice Springs with superb views and amazing bird sounds to wake up to – 3 Luxury eco-tents, Giles, Stuart and Gosse, available, sleeping a total of 2-3 people in each, in either queen-size or single bed configurations. The Heritage Caravan Park is not only dog-friendly but a great place for all caravanners and campers. The day was spent looking around Alice and out to nearby Standley Chasm / Angkerle Atwatye. A fantastic place to experience, a short walk into the chasm, which is best seen around noon when the walls of the chasm are easier to distinguish. This is considered to be the best lighting at this time of day. Down again to Coober Pedy, stopping at the roadhouses along the way for icy poles and such. We chose to stay underground again in Coober Pedy on our return trip… a little bit of fun! Ali’s Underground. What a great experience. It is family friendly, relaxing and a great experience. On down to Port Augusta where we stayed in the Highway One Motel for the night. 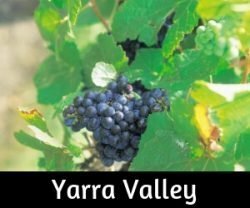 We had planned to go home via Mildura and the Murray River region but decided to take the girls into the Grampian Mountains instead, so headed that way and stayed the night in Horsham. 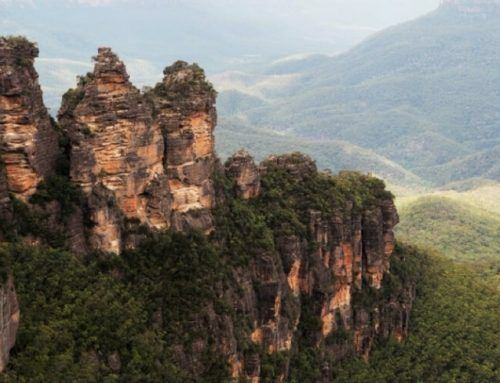 A drive through the Grampian Mountains and a quick stop in the township of Halls Gap was not doing this beautiful area of Victoria justice, as days can be spent exploring this region. That will have to keep for another holiday! Dogs are allowed into the towns and a few areas within the Grampians, but not allowed within the National Park boundaries. Halls Gap and the Grampians has enough accommodation to suit every budget, motels, guest houses, farm stays and cottages are all on offer. The Lakeside Tourist Park is very popular and the Eco Backpackers Hostel is a very friendly place with a great feel to it. The Halls Gap Caravan Park is another great place to stay and it is also dog-friendly. 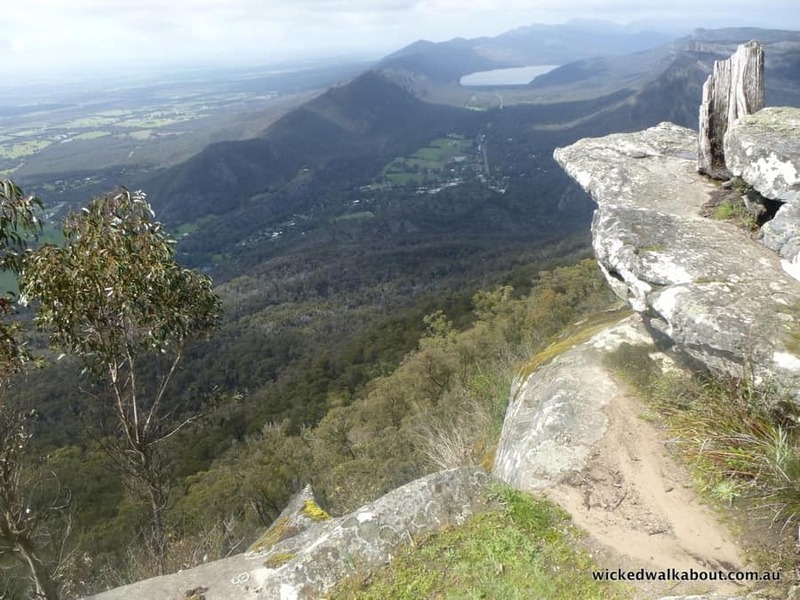 Victoria’s Grampian Mountains – wonderful hiking, rock climbing and stunning scenery. One of the lookouts with vistas across the valley and farmlands. We headed for home that night after travelling over 5,000 kilometres and having a brilliant family holiday. An extra week or two would have been ideal, but we still made the trip without feeling too hurried. Melbourne > Geelong > Along the Great Ocean Road (perhaps staying at Apollo Bay as an overnight stop). Thanks for the plan, makes it sound incredibly doable with 3 kids driving from Melbourne without a FWD.. It certainly is doable with kids, lots of playground stops and they are fine I think. have you got some plans underway? That is great to hear, Chris. I am sure you will have a terrific time. Let us know how you go! It was a really wonderful time! I want to find out more about your experience, because we are going to fly to Melbourne! Thanks so much for your terrific blog post! Like others above, we are planning on almost replicating this – just adding an extra week for travel. Do you think late August to early September is too late? Also, you said you didn’t eat out very much at all – is fresh food easy to source or did you take everything with you? 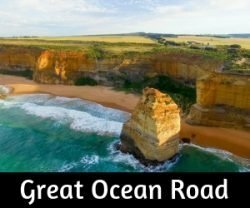 I hope to visit Australia in April – July 2019 on my motorcycle. I have question about the roads going to “The Rock”. Being on 2 wheels, dirt is not enjoyed with the 475 kilo Goldwing pulling a small trailer. My question is about the roads, are they hard surfaced or gravel? Great info on your blog, especially the hotel info. Hi Wilf, That will be an exciting trip on your Goldwing. 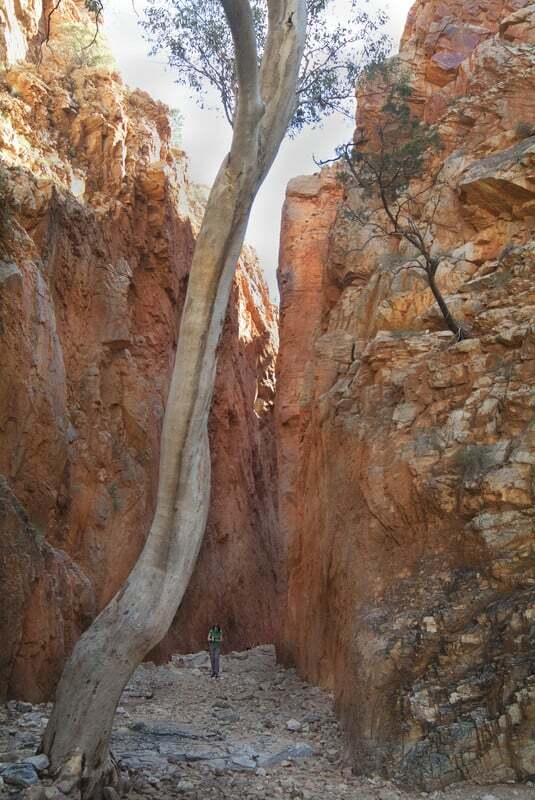 The roads are all sealed to the rock and into Kings Canyon as well as on up to Alice Springs. The main highways 1 which goes around Australia is all sealed now though people still have plenty of options to get onto unmade roads if they choose to. Are you planning on doing a lap of Australia? This looks fantastic – and we are thinking of mimicking your trip! Thanks for all your hard work. Are you willing to put a rough cost (all in) to your trip to give an idea of costs? If not – I understand and excuse the intrustion. Hello Catherine, I hope you do the trip, it is so much fun. No intrusion regarding asking how much it cost… though I do not really know as we did not pay much attention. We did not have unlimited funds though! Petrol varied and it all depends on the fuel economy of your car. We camped most of the time, if you check current prices at the different places listed, it may give you an idea. We did not eat out much at all, so that saved a small fortune! Hi your trip sounded amazing. My husband and I have just bought an outback caravan and are planning on coming over from New Zealand in May 2018 for a six month trip around Australia. We are looking at all the fantastic sights to see over there and can’t wait to hit the road. 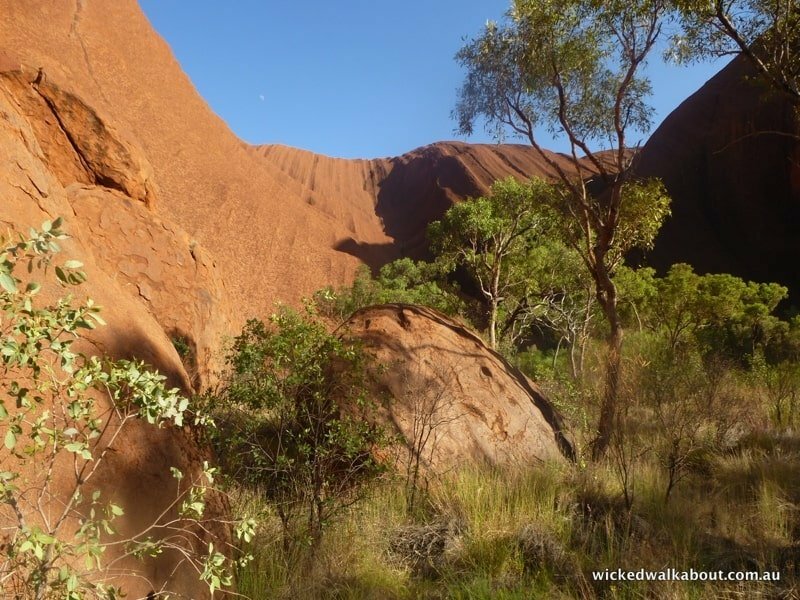 Uluru is certainly on our list to see and even more so after seeing your beautiful photos. Thankyou so much for all the information about the places to see. Thanks, Robin. It was a great trip to do. you and your husband will have a fantastic time I’m sure. May is a good time to start your trip. Have fun! We are going to do this trip end of this month -20th of Nov. till the end of Nov. perhaps a couple of days into December.. Combine tents, cabins, an motels..
Hi Frank, That is exciting you have the big trip planned soon. Prices can vary so much, but the links usually go to the best offer and will show nearby places and prices too. Have a look at a few of them and see what you can find. Enjoy your trip! 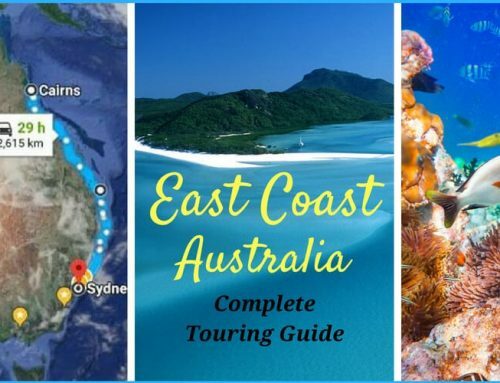 Great blog post – just can’t wait to follow in your footsteps – but probably from the Queensland end of the Country. Have a close friend who’s Mum came from Murray Bridge – she lived right on the bend of the river. Beautiful spot. 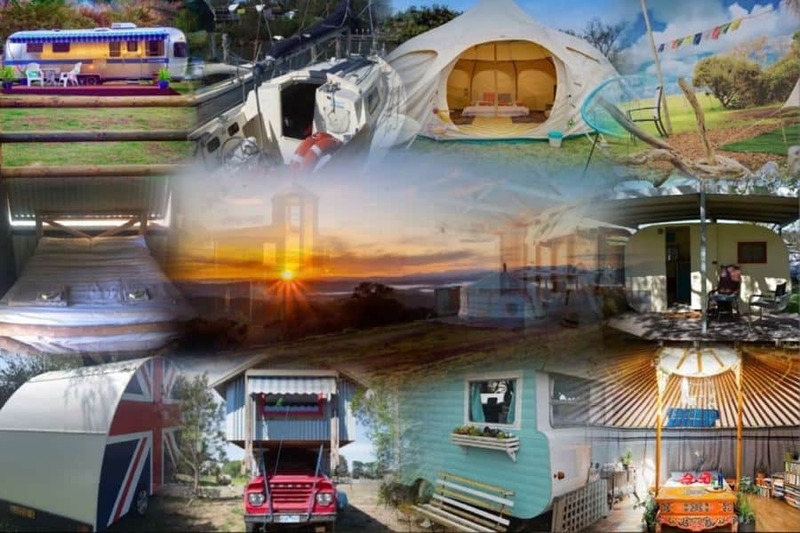 Thanks heaps for sharing your travels. It’ll be a bit different approaching from the Qld angle, such a great drive. Murray Bridge is a nice little town, I have always liked passing through there. Thank you very much what a first class effort of informing of your travels. I am planning to do likewise soon and really appreciate your efforts. I hope you have a fantastic trip, Richard. Happy travels!